What could be better than pumpkin-spice pancakes? Pumpkin-spiced pancakes filled with chocolate-hazelnut spread, of course! Try this recipe for a decadent autumnal treat that's perfect for a festive brunch—and easier to make than you think! Using canned pumpkin puree and pumpkin pie spice adds that distinct fall flavor without the need for pre-roasting or a whole array of spices. Freezing the Nutella ahead of time ensures that it won't melt when cooked with the pancakes. Serve with maple syrup for a crave-worthy breakfast treat you won't soon forget! Use your favorite gluten-free flour to make these GF! To make your prep even easier, plan ahead. Freeze the Nutella up to 3 days ahead of time, and mix the dry ingredients for your pancakes up to a week ahead. Pancakes are done on one side when the uncooked batter begins to bubble up. Per Serving: 392 calories; 18g fat; 47.1g carbohydrates; 9g protein; 67mg cholesterol; 408mg sodium. oh my gosh, YUM. pumpkin spice pancakes.... with NUTELLA!!! these are so delicious and once you finish freezing the little nutella disks, they're so easy and just like cooking normal pancakes. My new addiction! I have absolutely no portion control when I eat these. They're so good, I don't even use syrup or butter. Loving these Nutella stuffed pumpkin pancakes! Absolutely addicted and plan to eat all year round! They turned out perfect and were absolutely easy to make. 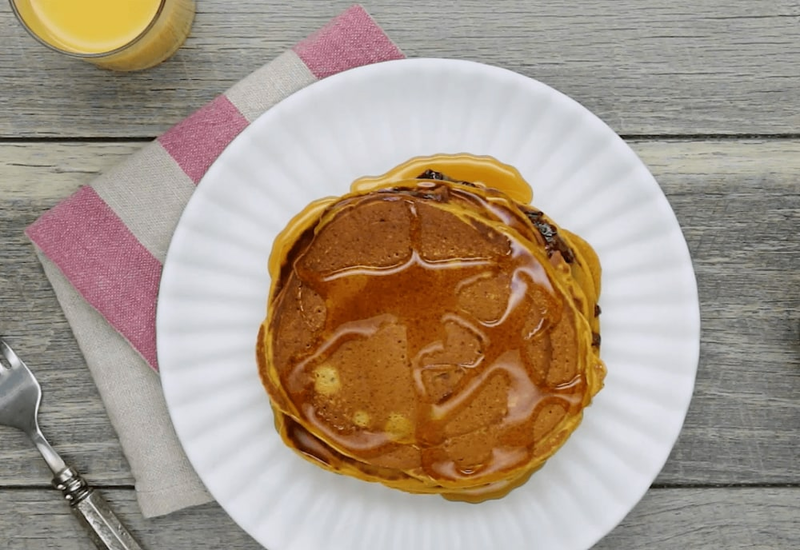 Love these delicious Nutella and pumpkin pancakes! Such an easy recipe and very festive for the Fall season! The batter also makes great waffles! Served these at a brunch and they were a huge hit!! So perfect for fall with the pumpkin spice and anything with nutellla is always a winner! !